AGV Helmets is a world leader in motorcycle helmet design and manufacturing. Established in 1947, AGV prides itself on it’s outstanding pedigree in racing performance, as the preferred helmet choice of race winning champions throughout the decades. AGV boasts superior technology as a result of their stringent research and development program: AGV Extreme Standards. 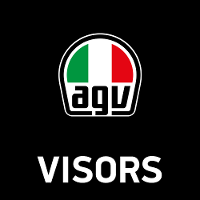 Featuring a rich and vibrant Italian heritage and culture, AGV adds Italian authenticity into the quality, style and performance of all of their helmets.